Will Project Natal be anything more than a glorified tech demo? Here's hoping! Maybe I’m speaking for the minority here, but I have to get this off my chest: Project Natal is sorta “meh,” no? I attended Popular Mechanics’ Breakthrough Awards for a few minutes last night, and they had on display Project Natal. It was that paint-throwing game. Now, I know that’s just a tech demo, but I left feeling a little concerned about its future. Now, it’s no secret that I’m an old school gamer who’s both afraid and annoyed by excessive change. I never bought a Wii for that very reason: I really don’t fancy flailing around like a fool when all I want to do is play a round or two of Street Fighter or whatever. (Admittedly, the Wii is fine for party situations when you’re all making fools of yourselves, and it’s about atmosphere more than anything else.) And while Natal—which always reminds me of Christmas for some reason—definitely gives off the initial, “Oh, that’s neat!” feeling, I really can’t see myself playing an entire adventure game using it. At the event was Natal, of which we were not allowed to take photos or video of, and a bunch of other inventions and whatnot that I can’t remember right now. I hung around for a hot 20 minutes, and the Natal demo was the same one that was shown at E3. You know, the one where you move your on-screen avatar to throw paint and whatever. And hey, it worked as advertised: you move your arm this-a-way and your avatar moves right along with you. It’s damn near 1:1. So again, the tech behind Natal is great. I’m just worried about the implementation. 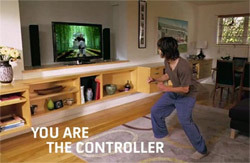 How many Wii games do you know that made real, clever use of the controller? How many shooters have tried to replicate the precision of a mouse and keyboard by having you move the controller in 3D space? What’s going to make Natal so different? At the very least it’s going to be a little while before we see the project’s Super Mario 64, something so radically different, if not radically better, than what preceded it. I don’t know, I’m rambling here, and lost my point several sentences ago. I guess I can boil it down to this: Yes, hooray for Natal and the underlying technology, because, yeah, it’s pretty damn amazing, I’m just having a hard time seeing it develop into anything more than a glorified tech demo. How would you play a Halo or Tekken with it?